Another day, another report about how underfunded and overcrowded London's transport system is. This time it's the Centre for Economics and Business Research who are doing the reporting on behalf of the lobbying group London First. And their shocking message is that we need "significant investment" in our Underground in order to keep London as one of the 'world's leading cities'. 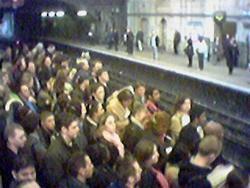 According to the research, overcrowding on the Underground will double by 2016 "if the the government doesn't increase funding of London's cracking transport system by £4.6 billion." There is one good stat to take away from all this though. Apparently "in 2004 there were as many journeys made on the London Underground as there were on the entire national rail network." We're not sure what the point of that fact is exactly, but we like it and will no doubt repeat it down the pub sometime soon. In related news: Londonist can exclusively reveal that if significant investment is made in the capital's transport infrastructure the number of job losses in those industries concerned with writing reports, conducting surveys and 'predicting the bloody obvious' will number in the thousands and clipboard manufacturers the world over will be forced to diversify.